In Part 1 I looked at the levels of accuracy and detail that customers have been able to achieve with our software. In Part 2 I’ll show how you can estimate the accuracy beforehand so you can achieve the required accuracy with the least effort. You can achieve almost any accuracy required by using an appropriate pixel size on the surface. However, using smaller pixels to cover a given surface area means more pixels in total, and therefore more images to capture and more time to process them. It is therefore important to be able to estimate the accuracy that will ultimately be achieved so that you can avoid spending more time and effort than is actually necessary for the task at hand. Compare the scale of the image and the scale of the object: the ratio between them is the same as the ratio between the distance d and the focal length f. Therefore, the ratio between the size of a pixel on the image sensor and the size of a pixel on the object is also the same ratio. OK, so now we know how big a pixel is on the object’s surface/ground. How do we work out the accuracy? So if the accuracy in terms of pixels is, say, 1/3rd of a pixel, and the ground pixel size is 3 cm, then the accuracy on the ground is 1 cm. Since the image sensor is two-dimensional, the plane parallel to it is two-dimensional as well, and each dimension on that plane has the accuracy described above. But there is a third dimension, and that’s the one parallel to the view direction — the “depth” (or “height”, for aerial photography) accuracy. A depth accuracy of (200 ÷ 50) × 4.3 = 17 mm. The next obvious question is “How do we know what the image accuracy should be?”. This one is a bit harder to answer because it depends on a few factors, like the quality of the images (noise and blur) and the accuracy of the camera calibration. In general, however, it is fairly safe to plan a project on the assumption that you will achieve an image accuracy of 0.5 pixels, and expect to get about 0.3 pixels. The exception is in cases where image quality is likely to be worse than normal (e.g. subsea imagery) in which case you might plan a project assuming about 1 pixel accuracy. The best accuracy we have actually achieved, using circular targets, is 0.05 pixels, and the best accuracy we have achieved using natural points is about 0.15 pixels. It is worth taking a moment to try to understand why the accuracy behaves like it does. Firstly, what do we mean by “image accuracy”? This can be described as “uncertainty in the precise location of a point in an image”. This uncertainty has multiple causes, but for now it’s sufficient to acknowledge that we don’t know exactly where a point is in an image to infinite accuracy, and so therefore we must associate an error interval with each point’s location. This uncertainty in the point’s location translates into an uncertainty in the direction of the ray that we project from that point, through the perspective centre, into the scene. 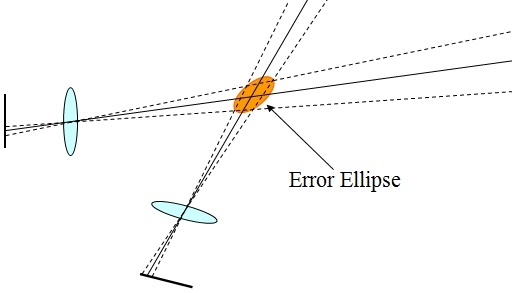 In that image, “planimetric accuracy” is uncertainty in the plane that cuts the ellipse at right angles to the view direction, and “depth accuracy” is uncertainty in the long axis of the ellipse. Now, if we move the cameras further apart — increasing the base:distance ratio — it’s immediately apparent why increasing the camera separation improves the distance accuracy: the ellipse becomes more circular. Conversely, if we move the cameras closer and closer together, the ellipse becomes more and more elongated, until it stretches to infinity at the point where the two cameras co-incide and we are in the same situation we would be in with just one image — no depth information at all. In the depth accuracy calculation above, this co-incides with the divisor b becoming zero, which means the value of (d ÷ b) goes to infinity. So, estimating the accuracy of the data beforehand is actually quite easy. The next question is: how much effort is required to achieve a given level of accuracy? In Part 3 of this series I’ll present a number of case studies of real-world projects to show the time and effort required to achieve the desired outcomes. This entry was posted on 19th October, 2010, 5:48 pm and is filed under FAQs. You can follow any responses to this entry through RSS 2.0. Both comments and pings are currently closed.